But for now, back to the question of the moment – what exactly was Meghan wearing under that gorgeous Givenchy dress? Meghan is a true fashionista and the world’s designers are falling over themselves to dress her – so did she bag herself an exclusive? My bet is that this Katharine Hamilton strapless bra , due out in SS19 and available in sizes from a 26 back would look stunning on Meghan’s slender frame and with gorgeous detachable lace shoulders she could have kept it minimal in the day and gone for this ultimate wedding night look later on. This best of British beauty will also be available in white. 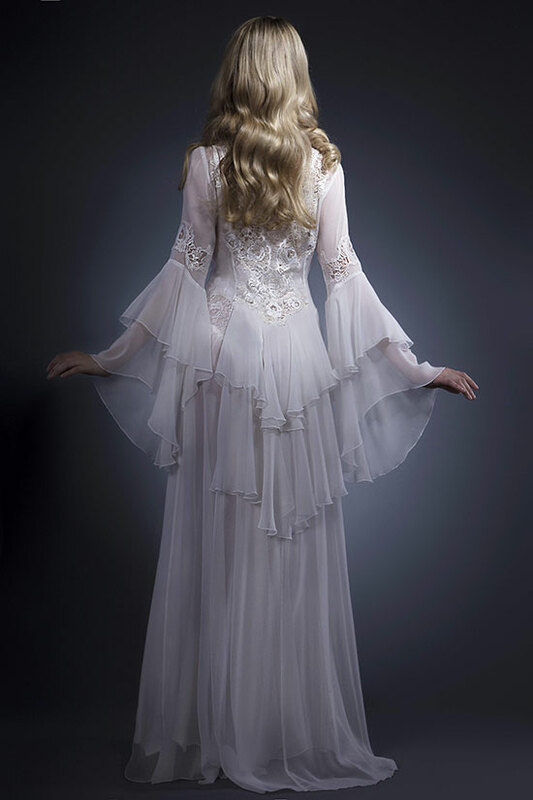 With appliqued leavers lace and waterfall sleeves and back, this Jane Woolrich negligee is a truly princess worthy piece and British couture at its best. For a nightwear look that’s good enough to wear to a Buckingham Palace ball, this Loveday London gown is the embodiment of British grandeur and luxury – did Meghan keep it simple in the day and dress it up behind closed doors? And what about gifts from Harry? An exquisite lace set, perfect for a wedding night and honeymoon look of laid back elegance from this London based brand, Shelle Belle. Harry’s a trailblazer and he knows his new wife is too. So did he buy her a gift that moved away from traditional white and ivory? This soft vintage rose robe by Katharine Hamilton would have been the ideal choice for a bridal look with a difference and the colours would look great against Meghan’s gorgeous skin. What was underneath that smart military outfit? Well, we all know he’s a fun guy… and a proud supporter of GB so my betting is on British Boxers – their classic cut boxers made from the finest cotton would have been the perfect choice – I reckon the red, blue and white striped version would have been right up Harry’s street…. what do you think? Whether my predictions are spot on or off the mark, with so much choice, I’m sure Meghan will have knocked Harry’s socks off, and of course every blushing bride can do the same with the great range of affordable yet princess-worthy lingerie on the market at the moment… Read on for ‘Helen’s Hot List’ – featuring my top tips for the best of British bridal lingerie brands and retailers so you can indulge your royal wedding fantasies too! Known to date for their bold colours and striking designs that combine playfulness, strength and sensuality, this hot off the press British brand were the first to launch Bridal lingerie, in January this year, to cater for the ever-growing Asian market in the UK. Inspired by the founder’s Indian heritage and meeting a need for bridal lingerie that isn’t just white or ivory, the Pure Rani collection is stunning – whether you are a bride or not. Coming soon at www.purechemistrylingerie.com– but here’s a sneak peek! Gilda & Pearl: From luxury basics to sensuous showstoppers, this chic London based lingerie brand brings joy to your days and romance to your nights. What’s more, the Ava babydoll is perfect for the bridal season. Helen Masters, host of LONDON BRIEFS is the former owner of the successful British lingerie & swimwear retailer, Pudding. She transformed her business into a global business consultancy and training company, helping retailers and brands in the intimate apparel industry after having a family and realising that a 7-days a week retail career may no longer be compatible! Pudding was one of the most successful UK independent lingerie stores of the last 10 years, with several awards under its belt, a nationally recognised bra fitting service and its own unique sales and service model which Helen believes was key to its success. Helen sees today’s lingerie industry as global and has recently expanded Pudding’s offering with an Electronic Retail Operations Manual for start-up lingerie retailers, and skype training courses to cater for its growing international client base, with courses such as skype bra fitting training proving a hit internationally. Helen is named in the UK’s 2018 Lingerie Insight Power List as a top ‘Industry Influencer’ and has received some impressive feedback from her clients. Take a look at her website www.puddinglingerie.com or contact her on consulting@puddinglingerie.com or (+44) 07789931097 for help on all things lingerie!